Lobuche has two summits, east and west, heights of 6119m and 6145m respectively. A continuous rim ties them but there is a sharp gap and a considerable distance between these two summits. 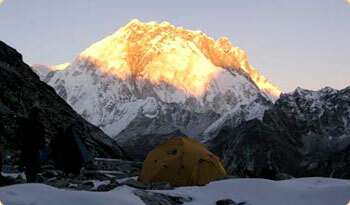 The east is recognized as a trekking peak whereas the west is identified as an Expedition. The first summit of Lobuche east peak was by Laurence Nielson and Ang Gyaljen Sherpa on 25th April 1984. The peak offers various existing routes and there is also a possibility of discovering new ones. The dark triangle of its rocky east face rises from the moraines of Khumbu Glaciers to a pleasant skyline and forms the south face. Lobuche East is reached by descending a marked notch and climbing steep snowy slopes to the top. Mostly the peak is climbed on the summit ridge only as far as a subsidiary snow summit, south-east of the true peak and before the notch. Mt. Everest, Khumbu Glacier, Mt. Lhotse, Nuptse, Mt. Makalu, Mt. Thamserku, different community with majority of Sherpa and grand Himalayan landscapes and old monastery. Day 02: Kathmandu official procedures in the morning followed by sightseeing, overnight at hotel. Day 03: Fly to Lukla (2,834 m) start trek to Phakding (2,611), overnight at lodge. Day 04: Trek to Namche Bazaar, overnight at lodge. Day 05: Rest at Namche Bazaar for acclimatization, overnight at lodge. Day 06: Trek to Tyangboche, overnight at lodge. Day 07: Trek to Dingboche, overnight at lodge. Day 08: Trek to Chhukung and hike around. overnight at lodge. Day 13: Trek to Lobuche Base Camp, overnight at tented camp. Day 14: Stay at Lobuche Base Camp, explore around and preparation for climbing. overnight at tented camp. Day 15: Ascend to Lobuche high camp, overnight at tented camp. Day 16: Summit Lobuche East Peak-6119m and back to base camp, overnight at tented camp. Day 17: Trek to Tyangboche, overnight at lodge. Day 18: Trek to Namche Bazaar, overnight at lodge. Day 19: Trek to Lukla, overnight at resort. Day 20: Fly back to Kathmandu, overnight at hotel. Day 21: Rest in Kathmandu, overnight at hotel. Day 22: Transfer to airport for departure to your ownward destination.